Please leave comments on KrautBlog. Except for a small boiler room underneath a work room off the kitchen, we didn't have a basement when we moved in. But we noticed over the years that termites were doing their damage somewhere underneath the house and that there were leaks in the inaccessible heating pipes. 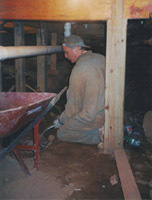 So, one day in 2000, I took a sledgehammer and opened a hole in the only foundation wall that was visible because it formed one side of the boiler room. I was confronted with a sheer wall of earth and started diggingduring summer vacations in 2000 and 2001, and after retirement in 2002, with a sustained effort to get the job done. The pictures tell (part of) the story. The back yard traps run-off from the hill behind and turns into a swamp after extended periods of rain. 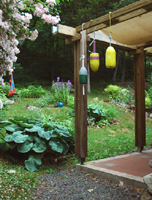 It may take days before it has dried up, and the yard is not very usable during that time. We decided to build a tiled terrace or patio along the back wall of the garage. It would be accessible from an enclosed porch so that we can walk on it in any weather without dragging mud into the house. A glass roof will allow us to sit there even in light rain, and translucent fabric underneath will take away glare from the sun. We were hoping to recreate the luminous glow we remembered from oriental bazaars. 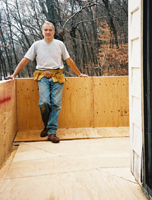 When we moved in, a deck was sitting on top of the garage at a distance that varied with the slope of the garage roof, which shed its water toward the back. The gap was covered by vertical 2x4's that also supported the guardrail of the deck. Painted white, they formed a very distracting graphical pattern. One could also look directly onto the unattractive garage roof from the back. In addition, the roof leaked: Layers and layers of roofing material piled on top by generations of roofers could not overcome the basic problem that the pitch was too flat. Finally, the deck itself was not large enough to put furniture on because the better part of it was occupied by a sun room or study added later. I decided to completely rebuild the deck as a properly detailed flat roof one could walk on and to pull it out over the garage at the front and side, not only to make it larger, but also to allow me to pull a parapet wall down to form a "folding screen" that completely hides the gap between the deck and the garage roof. After completion of the upper deck and the back wall of the patio, the old garage roof is now completely inside; that is, it can be removed, in its entirety or in parts. This gives me a chance I have been waiting for: To completely rearrange circulation in the west wing of the house. The garage floor is between 6 and 7 feet below the elevation of the first floor. The stairs leading from the garage to that floor are partially in the garage, making it impossible to park a car in that half of it. The other part intrudes into the work area off of the kitchen, making any placement of washer and dryer awkward; it also intrudes into the boiler room, reducing the usable area there. 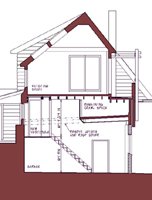 Furthermore, the study above the garage is accessible only via a circuitous route and through a bedroom, which greatly reduces the usability of both bedroom and study (and that of the upper deck). Removing the old roof over the back half of the garage gives me the headroom I need to pull the stairs completely into the garage. These stairs will lead to a small vestibule at the elevation of the work area from which one can enter not only that area, but also the upper study, via a new flight of stairs cut into the floor of the study. These stairs will provide a more direct access to the study and deck, bypassing the bedroom entirely.